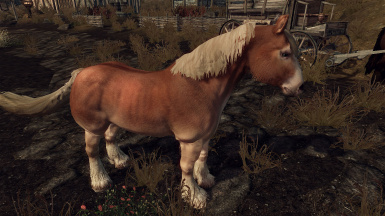 realistic HD 2k textures for Vanilla horse body. No blocky re-sized vanilla textures or normalmaps. 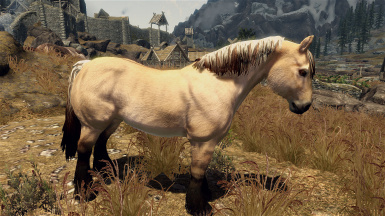 Lore friendly horse breeds which suit the Skyrim Shaggy pony look but waaaay nicer. 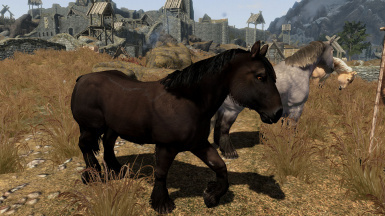 ALL horse breeds will now have individual eye colours and manes, also adds unique Frost and Shadowmere textures. I give permission for any other modders to edit or use these textures in their mods, ONLY if they are not for profit. I will not allow any part of this mod to be sold, and ask that you notify me before you intend to use any part of this mod for your own work. 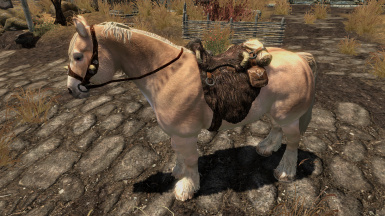 New 'realistic' 2k textures for Vanilla horse mesh. No blocky re-sized vanilla textures or normal-maps! Each horse breed will have different coloured eyes, bodies and manes. Either compressed 2k or uncompressed 2k files available. 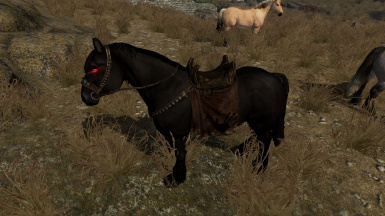 Optional file: a darker eyed variant for the Black Fell pony. Optional file: Alternative Frost textures which make him a fair mealy chestnut rather than solid white. Like my textures? Also Like Wolves and the idea of playing as one in Skyrim? New verision with installer by SparrowPrince. includes all optional files. You dont need to update if you have already installed 2.1 and your optional files, as this version is only to replace the existing file with an installer and no content was changed. * Please note, I DO NOT use ENB and have no visual effects turned on with any of the above images, just vanilla Skyrim with texture replacers. which affects all horses, frost included. 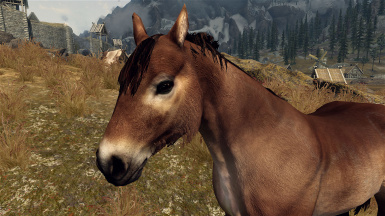 Make sure you install AFTER all other horse mods and back up your game first just in-case it does any funny stuff. 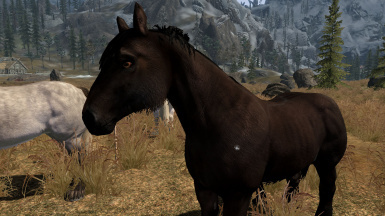 This mod Really shouldn't conflict with other horse mods which only affect behaviours and such. 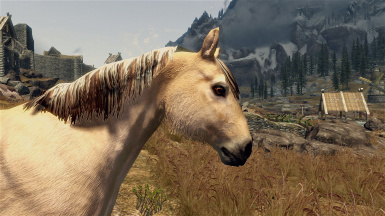 Reported to work with Convenient horses, Convenient horse herding, Wild horses of skyrim, Scenic carriages, and Name Your Horse. 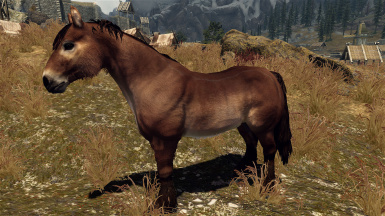 Any horse mods which change the horse MESH are not directly compatible as this mod introduces new .nif copies for EACH breed of horse. 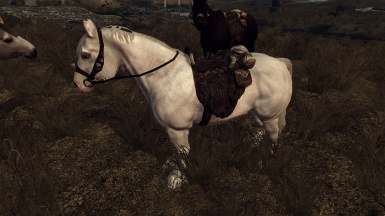 Most horse mods only use ONE .nif mesh. 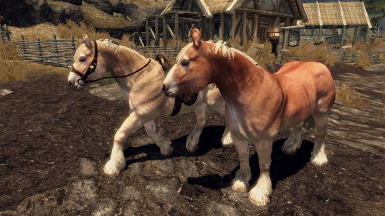 Textures ONLY are compatible with other horse body changing mods that use vanilla texture maps, though to get them to work requires manual installation of ONLY the texture files, AND for them to be renamed accordingly. If you are using these textures with a different horse body mesh, you WILL need to edit the .nif files of your existing horse body to find the texture files correctly if you want the individual manes and eye colours. Otherwise just copy and rename the body colours, and your choice of two of the mane colours to your texture folder. 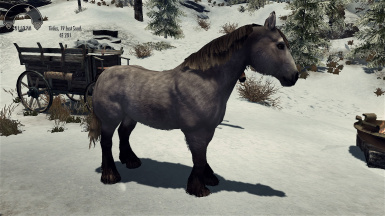 If you want Frosts (white horse, blue eyes) colouring for your normal breeds then just copy the frost.nif mesh and re-name it to replace one of the other horse breeds .nif that you like less. DO NOT expect the textures to show up if you replace the body meshes without re-directing the textures in nifskope. I give permission for any other modders to edit or use these textures in their mods, though I do request that you let me know first what you are using them for and credit this mod. Q: Why are my horses shiny? Q: Why does the FJord horse have glowy lines around its mane? A: Thanks to Nivea for this info: Its the Specular Color shader in the nif, you can change it to be any color or lower it to black to help remove it. In the next release which will include more colour variants, I will look at fixing this.